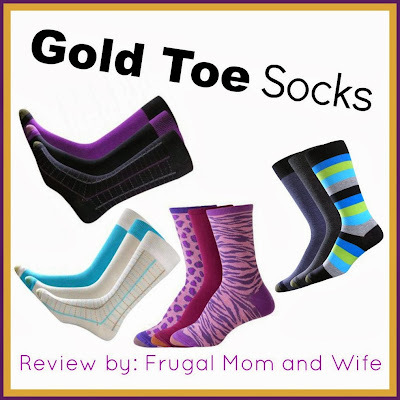 Frugal Mom and Wife: Gold Toe Socks Review! Gold Toe Socks are made with the finest yarns and reinforced for longer, more comfortable wear. Their toe seams are specially flattened for a smooth fit. The heels are always well rounded for support and comfort. Gold Toe Socks have long been the smart choice because they fit better, feel better, and last longer. You can't mistake any other sock for Gold Toe, only one carries the unique gold toe in each and every sock. I really love the support and overall feel of the Gold Toe Socks brand. Not only do they look quality made but you can tell with every step that your feet are well taken care off. Warm and made to last with wonderful designs to choose from. The signature design of the gold toes is so delightful, I really like it. I have been wearing Gold Toe Socks for a while now and I just love them.